One: All who gather here are sons or daughters. All: We praise God for the women who gave us life. All: We give God thanks and praise. All: We pray for peace. All: We pray for healing. All: We pray for those that mourn, and give God thanks for life eternal. All: We weep with those with broken hearts. All: We pray that we may be their village, offering real help in hard times. All: We both celebrate and mourn with you, and hope their wings are as strong as their roots are deep. All: We pray for wisdom and patience. All: We pray the caregivers have those who care for them. One: For those who are waiting and sometimes struggling with the biological process to bring new life, and for those who are waiting for adoptive process to be fulfilled. All: We wait eagerly with you, and offer you our hand to hold in the trial. Permission to use this litany for public worship is granted. If it will be reprinted in worship bulletin, please attribute with link to http://fatpastor.me. Also, leave me a comment and let me know you’re using it, you don’t have to wait for me to reply. It just makes me happy to hear when other congregations use liturgy I write. Jesus told them this parable: “Suppose someone among you had one hundred sheep and lost one of them. Wouldn’t he leave the other ninety-nine in the pasture and search for the lost one until he finds it? And when he finds it, he is thrilled and places it on his shoulders. When he arrives home, he calls together his friends and neighbors, saying to them, ‘Celebrate with me because I’ve found my lost sheep.’ In the same way, I tell you, there will be more joy in heaven over one sinner who changes both heart and life than over ninety-nine righteous people who have no need to change their hearts and lives. I think the dandelion should be the official flower of Mother’s Day. I have known a lot of great Moms in my life. On Mother’s Day the custom is to give a gift to the mothers in your life. Today, I am reflecting on the gifts that I have received from the mothers I have known. Thank you for the gift of strength. You showed me strength beyond measure. You lived out the true meaning of the word fight because you were fighting not for yourself, but for your girls. You showed me endurance when the medicine and the disease were destroying your body. Even when the possibility of cure was gone, your spirit lived on. You reminded me what it means to live, and revealed to me a strength that comes with the abiding presence of God. Thank you for your gift of gentleness. Your last words to me were, “Oh Robby, she’s beautiful,” as I lowered my newborn daughter to your side. Hers was quite possibly the last face you saw. It was your last gift to me, the last of many. Thank you for the ice cream and Wheel of Fortune. Thank you for letting “my” dog live with you. Thank you letting me help you with your word searches. Thank you for giving me a glimpse of the Kingdom when I sat at your table, and revealing to me the aroma of heaven. Thank you for showing me how to dance – even on the table if the occasion required it. Thank you for loving me as your own and showing me what it means to be a friend. Thank you for dividing my sorrow and multiplying my joy. Thank you for the s’mores around the fire in the summer, and the songs of love and family around the fire at Christmas. Thank you for providing a place I knew I would always be welcome. Thank you for your gift of support. Thank you for believing in me even when I didn’t believe in myself. You weren’t just my biggest fan. For most of my life I thought that you were my only fan. Thank you for helping me get back on my bike after I ‘fell off’ (we’ll just leave it at that), and for giving me lunch money when I forgot mine at home. Thanks for teaching me to hail to the orange, for the letters, and for the surprise boxes of cookies in the mail. I promise when I finally write my book, you’ll get the first copy. Thank you for your gift of faith. Thank you, not just for bringing me to church, but for living with Christ. Thank you for loving Dad more than anything, and for loving God more. Thank you for birthing in me a God-given vision, and for guiding me gently as I learned to see it for myself. Thank you for buying me the watch I wanted – the one with the tiny little buttons that was so impractical. Thank you for buying another one when I lost the first one. Thanks for letting me tight roll my pants even though you knew I looked ridiculous. Thanks for the sawbucks on Friday nights, and for staying up for me. Thanks for letting me grow. Thanks for letting me go. I know someday I’ll have to do the same, and I pray that I can do it with the same amount of grace that you showed. Thank you for your gift of forgiveness, grace, and love. You make me a better person every day. Your forgiveness reveals to me the grace of our God, and I know that the Holy Spirit has bound us with cords that cannot be broken. Together we are more than we could ever be apart. You have given me purpose, and you have given me two girls that fill my world. When I see you read to them, play with them, laugh with them, snuggle them, correct them, and teach them I see the grace of God. Even when I’m awfully low and when the world is cold, I feel aglow just thinking of you. And I remain deeply, hopelessly, endlessly in love with you. Thanks Mom. Or should I say, “Thanks Moms.” I’ve been loved by a lot of Moms in my life. They’ve given me so much. I hope you like this dandelion bouquet. Many years ago for Mother’s Day my brother built a flower garden for my Mom. He was sort of the family gardener, and it was common for us to plant flowers for my Mom for Mother’s Day. The garden was usually his place to plant fruits and vegetables. We usually had a few big pumpkins, and I remember trying sweet corn one summer. It was his little corner of the yard. This was his senior year in college, so he decided to convert the vegetable garden to a flower garden for Mom. He knew it would probably be his last year doing the planting, so he wanted to leave her with something that would last. He planted all perennials. 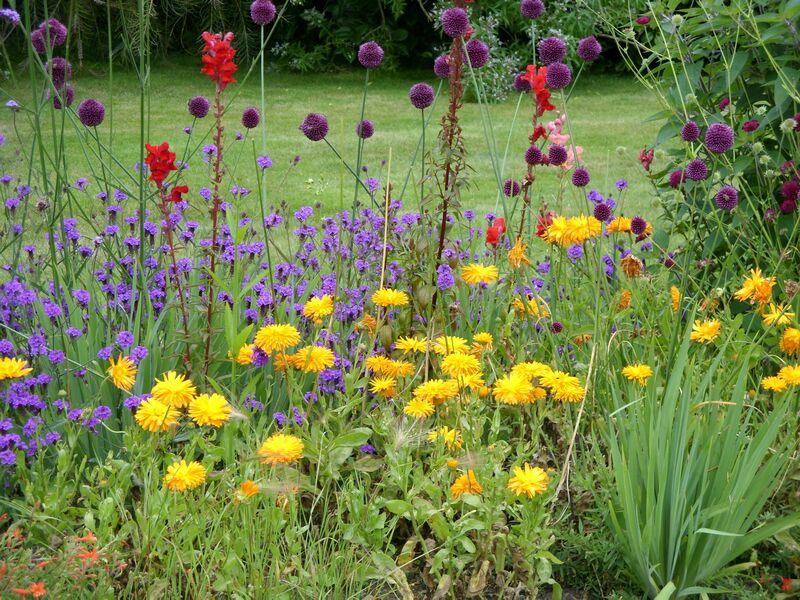 He planned it out meticulously and worked hard at giving her a beautiful garden full of depth and color and variety. It was the most beautiful gift I have ever seen. Don’t you know people like that? Some people see the flowers. Some only see the weeds. That garden is still beautiful. It has changed some over the years. Another friend gave my Mom a bird bath. There was a flower added that was her sister’s favorite. The maple tree in the corner has grown quite big. Each spring it comes back and the gift is renewed. I’m not sure my Mom has ever pulled a single weed from it. Some people see the flowers in the garden. They enjoy the beauty in the world. They gaze at sunsets and marvel at the ocean. Some see grace and joy and love. Some appreciate their many blessings, and hope that somehow they can be a blessing to the world. Others see the weeds. I don’t deny the weeds are there. I know that there is pain in the world. All of creation has fallen. I know that we have a lot of work to do as a people of God. There is injustice to fight and there are souls to save, but when presented between the choice to focus on the flowers or the weeds, I choose to rejoice in the flowers. When given the choice to focus on God’s grace or the Creation’s fall, I guess I choose to err on the side of grace. I remember mixing the blueberry muffin batter. I was so careful not to spill the little tin of blueberries on the counter, because I knew it could stain. My brother was really in charge of the batter, but he would let me mix it too. He added the secret ingredient – the honey. It was my job to make the tea, which meant I put the mug of water in the microwave. We put the carefully crafted breakfast on our Dukes of Hazard TV tray, but we would cover up Bo, Luke and Daisy with something classy – like a paper towel. Just one more added touch to make it perfect – go out in the yard and find a flower. Pick the dandelion, put it in the glass and a perfect Mother’s Day breakfast in bed was ready. I wonder how much the founders of Mother’s Day would recognize today’s ritual? What would they think of the handmade cards, the breakfast in bed, and the dandelion bouquets? There are three women generally recognized as the co-founders of Mother’s Day. All of them had similar ideas, and were inspired by similar motives. They were churchgoing women who wanted to recognize the role of mothers. They were crusaders, rallying around the universal power of mothers to make the world a better place. Their passion, their overriding sense of call, was to the cause of peace. Julia Ward Howe, who wrote, “The Battle Hymn of the Republic” was appalled by the evils of war and wanted to create a day where women would come together to make change in the world. Juliet Calhoun Blakely came to the pulpit in her Methodist Church in Michigan when the pastor was too drunk to finish the job and preached about temperance. 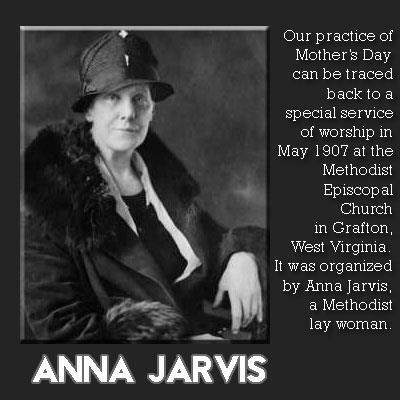 Anna Jarvis taught Sunday school at a Methodist Church in West Virginia. Jarvis advocated for children’s health and welfare and promoted peace in a community torn by political rivalries. It was in West Virginia that the first Mother’s Day was officially recognized in 1908. On Mother’s Day we stand in the shadow of these mighty women, and I wonder what they would think. These were women that had a strong sense for the pain in the world. What would they think of the sentimentality of the day they helped create? They understood pain in the world as only a mother could. Their sons’ bodies were sacrificed on the altar of war. Their sons had missing limbs, broken bodies and shattered spirits. Their sons abused alcohol, wasted their income, their time, and their energy on the promise of an empty bottle. Their daughters lived with terror of domestic violence. Their sons and daughters died slowly of disease. They were mothers – not just of the offspring they raised – but of all children. It was in the midst of this pain that they stood. Out of the ashes of war, out of the shadow of abuse and alcohol, out of the despair of disease, the mothers stood. They were angry with the state of the world, and wanted a day to recognize the power of mercy and love. They wanted a day to recognize the power of women – mothers – to make a change in the world. What would they think now? What would they do when they saw women in Africa weeping over a child dying every 45 seconds of malaria? What would they say to those that claim that health care is a privelege, not a right? What would they think when they saw more sons and daughters going off to another war to kill the sons of other mothers? How would they respond to the meth labs in living rooms? What kind of pain would they feel? I’m guessing that they would feel just as mothers do today when they see their children suffer. I’m guessing they would continue to stand with their fellow mothers and support a local shelter for victims of domestic violence. They would get involved with Imagine No Malaria, a project with a plan to eradicate malaria deaths. They would help at food pantries at their church, organize health clinics, contribute to literacy campaigns. What would they do when they saw that their children were in pain? They would do what mothers do today: they would work, volunteer, preach, donate, teach, mentor, guide, and pray. What would they think of a dandelion bouquet? I think they would treasure it just as my mother did – like all mothers do. They would see the love out of which it was made. They would know that all the work they do in the world is for this: So that children every where can live in peace. Those women, and women before them, and women since them have wanted this: to live in a world where all of God’s children are free to pick a dandelion bouquet – free of disease, free of fear, free of war. Its a dream we all share. It is a dream for which we all work. 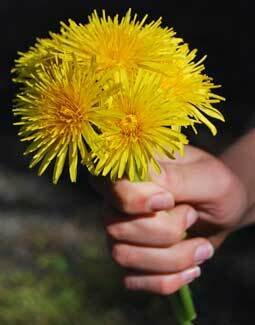 In the meantime, take the time to pick a dandelion bouquet, and say a prayer for mothers. 17 years ago I told you I knew what I wanted to be when I grew up. I was 15 years old. It was the night your Dad died, and I was being tormented with a whirlwind of emotions. In the midst of my emotions, I picked up a notebook and decided to write. I didn’t know what I wanted to write, but I knew that something deep inside of me was telling me to write. I realized in that moment that I was a writer. I knew what I wanted to be when I grew up. When I told you that, I was expecting you to say, “Really, what do you want to be?” Instead you said simply, “You are going to be a minister.” I thought you were crazy. Yet something within me never let go of that idea. On the night that Grandpa died, something was born in me. It was a spark that was probably there all along. It was a spark that only you recognized. It was a spark I figured would just fizzle out. I was wrong. Tonight I am going to be ordained as an Elder in the United Methodist Church. I am going to kneel before you, the church, the Bishop and God and take vows to dedicate my life to the mission and ministry of Jesus Christ. Tonight I will promise to teach the Bible to those seeking a deeper understanding. I will promise to preach good news to the poor, freedom for the captives, and forgiveness to sinners. I will promise to sit with a dying man as he takes his final breaths. I will promise to hold an infant above the baptismal waters. I will promise to break bread with sinners and share the cup of forgiveness. I am going to dedicate my life to making disciples of Jesus Christ for the transformation of the world. I will take a solemn vow and enter into a covenant relationship with the Church, the body of Christ – the only source of truth and salvation I have ever known. The Church is not perfect. It’s a good thing, because neither am I. I love the United Methodist Church. I know it has made mistakes, yet I love it anyway. I love it for so many reasons, but ultimately I love it because it was through the United Methodist Church that I discovered the love and grace of Jesus Christ. And that is why I want to thank you. I want to thank you and Dad for bringing me to church as a kid. I want to thank you both for teaching me about the love of Jesus in word and deed. I want to thank you for valuing my education, and encouraging me to reach and dream and dance. I want to thank you for loving me, even when I forgot my homework, even when I forgot to pick up the apples in the yard, or when I forgot to give you a message. I want to thank you for loving me so much that you could see through all of my mistakes and imperfections. I want to thank you for loving me so much that you could see something about who I am, and who I could be. When I kneel before the Bishop tonight, there will be so many people there with me. There will be people of five wonderful churches that embraced me, welcomed me, and molded me into a man, husband, father, and pastor. There will be teachers and coaches that pushed me. There will be friends that laughed with me. There will be all four of my grandparents, two aunts and an uncle. When I think of all that has led me to this point in time, I am humbled. I know that you will be there too. I thank God every day. I thank God for giving me more blessings than I can possibly deserve. I thank God for family and friends. I thank God for life, life abundant, and life eternal. I thank God for the awesome privilege of doing God’s work and serving God’s children. And I thank God for you, and for that preposterous suggestion you made to me so long ago. It turns out you were right. Thank you. This post is dedicated to the women in my life. It is dedicated to my daughter, my wife, my mother, my sister, my cousins, and my friends. It is dedicated to thousands of women who have been made victims, and to the thousands of women who will never be victims because of the work of Erin Weed. My current Site of the Week is the home of Girls Fight Back. I met Erin in high school. I knew her at first only as the girl that shaved her head. Which she did to raise money for cancer research and to honor her friend that was going through chemotherapy. We became friends as time went on and I came to know her as a funny, kind, creative leader of our class. Erin Weed is a professional speaker, author, self-defense expert and Founder/CEO of Fight Back Productions. Her calling to the field of violence prevention and self-defense began in 2001 as a direct response to the murder of her friend and sorority sister, Shannon McNamara. After Shannon’s death, Erin abandoned her career in TV production to study with the best anti-violence activists, personal safety specialists and self-defense experts in the world. In January 2002, she began traveling the nation giving keynotes and seminars in schools and businesses. To date, she has spoken to half a million people with her uplifting and empowering message of staying safe from violence and finding peace in the process. So I went back into the old skype chat and found some that others came up with. Again, I’m not attributing them unless they claim them. Yo momma’s so nice, she tried to jump into the pool, but walked on it instead. Yo momma’s so nice, she invited Satan to church, and served him communion. Now he’s working at a soup kitchen downtown. Yo momma’s so nice that Ozzy Osbourne enunciates properly and refuses to curse around her. Yo momma’s so nice that violent self-aware robots would make sure she’s safe before engulfing the world in a nuclear holocaust. Yo momma’s so sweet that I kissed her cheek and got diabetes. Yo mama’s so nice that Romulans went back in time to build her a planet. Yo mama’s so nice that her housecats pee rainbows. Yo momma’s so nice that Metallica wants her to download their music. Yo momm’as so nice that Christian Bale asks her nicely for a cappucino. Yo momma’s so nice that Christopher Hotchens believes in her. Yo Momma’s so nice that she joined a social networking website and they renamed it YoMommasBook. Yo Momma is so nice that after an hour with her, John and Kate are happy again. Yo momma is so nice that if she were cold, Iggy Pop would find a shirt to give her to put on. Your momma’s so nice that MLK nominated her for the Nobel Peace Prize. And she won. And then they renamed the prize. Yo momma’s so nice that the Rolling Stones won’t smoke in front of her. Yo momma’s so nice that Puddle of Mudd started singing “She Hates Me,” saw her, then stopped. Yo momma’s so nice that Mary wears a t-shirt that says, “Yo momma is my homegirl.